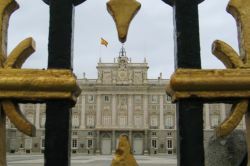 Madrid: Though our plane landed at 1:30 p.m. we first had to wait 1,5 hours until we could pick up our bikes which we also had to reassemble (we just hat two small boxes for our bikes and had to take of the racks). It was already around sunset, when we finally have been ready, and so we camped close to the airport behind a bush. Every road around the airport is a freeway and so we haven't been allowed to cycle on them and so we took the Metro in Downtown Madrid next morning. It's December 6th and so the whole town is crowded, but we still enjoy some sightseeing. 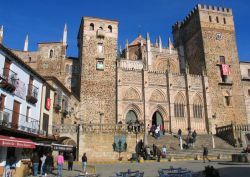 Toledo: Toledo, sitting on a hill above Rio Tajo, is one of the most famous tourist attractions in Spain. 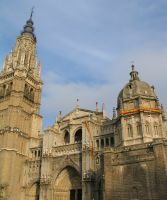 With its old churches and mosques, the beautiful cobblestone alleys, the beautiful street cafes and last but not least the cathedral, Toledo is quite an awesome place. We stroll all day long through the alleys and enjoy the feeling of this old town. Sleeping in a castle: In Toledo the Youth Hostel in inside of an old castle and as we never slept in a castle on our trip we go for it. The lady at the reception seems to like us and so we end up with a private room with our own private bathroom. The photo, by the way, shows the Youth Hostel at night. 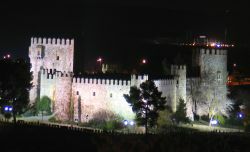 Toledo at night: Of course Toledo is also illuminated at night, which is especially cool and beautiful right now around Christmas. 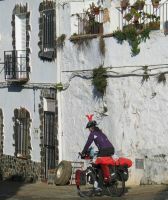 Rollercoaster: Though we both have been already to Spain we didn't remember it to be that hilly. Though frosty at night it's sunny and warm during the day and so we really enjoy cycling through the countryside. Guadalupe: Guadalupe is a small town in the hills which boasts a huge monastery. As the people here in the mountains tend not to open their mouth while speaking and also seem to have a pretty strong accent I ask the lady at the ticket office if the guides are speakig clear and not too fast. "That depends on the guide" is her answer, and as she's not willing to find out if the next guide speaks understandable I decide not to visit the monastery. Fog: After two sunny days suddenly fog moves in. First we still could see the thousands of crane's, who stay here for the winter, but then everything disappears. The fog gets so thick, that two policemen stop us and tell us, that we would have to wear a bright yellow jacket if the sight is that bad. As they are very very generous to us, they still allow us to cycle into the next village (about 3 Km away), but after 1 Km we leave the road and pitch our tent. 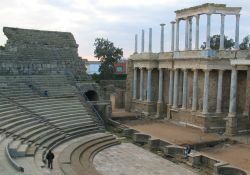 Merida: During the Roman Empire Merida was the biggest Roman city in Spain and so one can visit quit some old ruins. The theater and the amphitheater (for the gladiator fights) were built 15 BC and 8 BC and were so big, that they could hold 20.000 spectators. Short visit in Portugal: To avoid a couple of mountains in Spain we headed a bit to the west and cycled through Portugal. 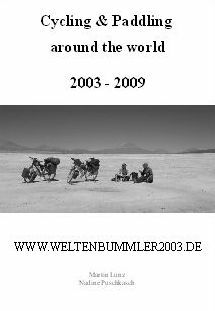 The people have been very friendly, but communication was quite difficult, as we speak no Portuguese and as they speak hardly any English or Spanish. Unfortunately Portugal was not as flat as expected and so we also have to clime quite some hills. 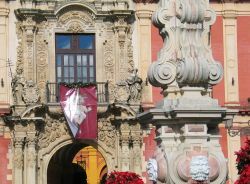 Sevilla: Sevilla has quite a long and exciting history. Sevilla was already an important trading center from the Phoenecians long before the Romans conquerred the Iberian Penninsula. Later Sevilla was under Muslem rule until they were reconquerred from the Spanish Christians. Besides the huge Cathetral and the Alcázar, the muslim palace, the narrow alleys in the Jenish quater with it´s small squares and old houses are well worth the trip. Winter storms: Spain is supposed to have plenty of sunshine, but unfortunately we hit a quite unusual period of rain and storms. As soon as we left Seville it started pouring and the wind became so strong and loud that we slept with earplugs. As we're cycling through the mountains we change our direction quite frequently and so we even get some tailwind once in a while. Unfortunately its raining so heavy, that we're wet to the bones when we arrived in Almuñecar. 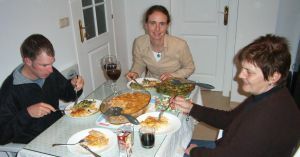 Christmas: We spent a lovely family Christmas with Nadine's mum and her husband Uwe. It's pouring and we are really happy to stay inside the holiday apartment. As we haven't seen each other for quite a long time there are of course a lot of stories to tell and so it's not really boring. Uwes and Martins mum sent us some homebaked Christmas cookies. what a treat! Alhambra: Of course we also set out for some sightseeing. 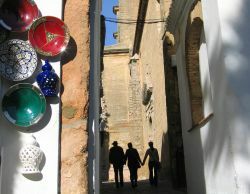 The chosen object: The Alhambra in Malaga. Having challenged the chaotic traffic in downtown Granada strolling through the Alhambra was quite a pleasure. 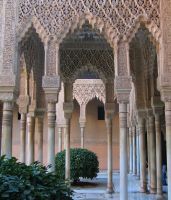 Granada was the Muslim capital for 800 years, and therefor the Alhambra became one of the most important and beautiful Muslim buildings in the world. 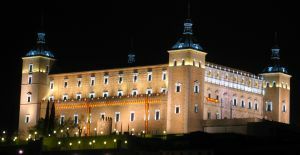 The head of the Alhambra is the Nazarid palace with its palacios, stuccos and woodworks. But also the gardens with its fountains, watercanals and artificial lakes are pretty impressive. Salobreña: The old town of Salobreña sits on top of a hill right on the coast. Though the hill didn't look that big, we were quite puffing while climbing through the narrow and steep alleys and therefor had to recover in a beautiful small cafe. 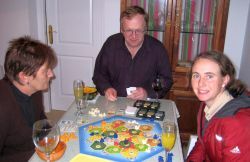 New Years Eve: We've been a bit afraid that we would fall asleep long before midnight and started to play the boardgame Settlers of Catan. Suddenly time started running and before long we could welcome the new year. Ronda: Now wonder, that Ronda, with it's location high above the El Tajo gorge is the pueblo blanco (white village) with the most dramatic location in Andalucia. 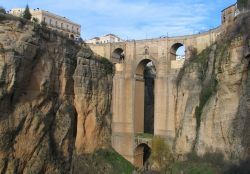 A total of 3 bridges over the El Tajo River into the old Muslim town. The new bridge was built in the 18th century and is therefor not really new any more. We explore the old town with it's narrow alleys and enjoy the warm sun and the great viewpoints. 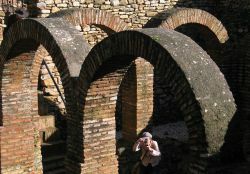 Baños Arabes: The old Arabic bathhouse is locate right next to the eldest of the three bridges. At that time this bridge was the only on and so everyone who entered the town could first was down all the dust from the road. 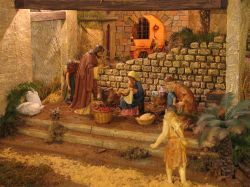 The water for the baths was pumped up with a waterwheel turned by a donkey. Then the water was heated up from a huge oven and later on distributed into the pools inside the bath. The hot air from the oven was used to heat up the floor from underneath. Unfortunately not much is left from the beautiful old bathhouse.